The Criminalization of Lying: Under what Circumstances, if any, should Lies be made Criminal? 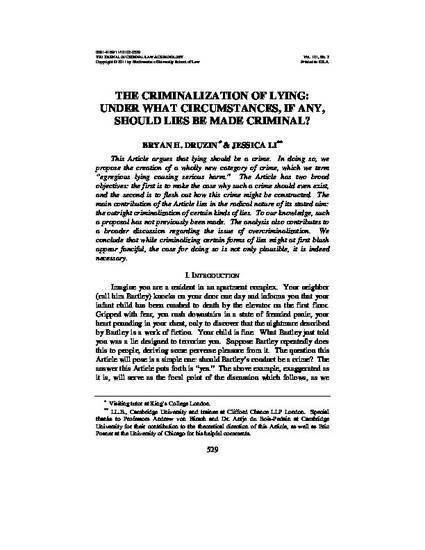 This paper argues that lying should be a crime. In doing so we propose the creation of a wholly new category of crime, which we term “egregious lying causing serious harm.” The paper has two broad objectives: the first is to make the case why such a crime should even exist, and the second is to flesh out how this crime might be constructed. The main contribution of the paper lies in the radical nature of its stated aim: the outright criminalization of certain kinds of lies. To our knowledge, such a proposal has not previously been made. The analysis also contributes to a broader discussion regarding the issue of overcriminalization. We conclude that while criminalizing certain forms of lies might at first blush appear fanciful, the case for doing so is not only plausible, it is indeed necessary.